Has a community garden, a solar panel cross and some very large water tanks. They have been involved in the Five Leaf Eco-Awards since 2008.
overgrown unused church tennis courts sparked the idea of their potential use as a community garden. The church approached COGS in late 2005. An agreement prepared by COGS was agreed to by the church council. The new O’Connor garden group conforming to COGS rules was formed and started taking in new memberships and transfers. We successfully applied for a local government establishment grant, and soon changes were noticed as watering pipes and garden beds were laid out and installed. Very soon vegetables and flowers changed the appearance of the area completely. 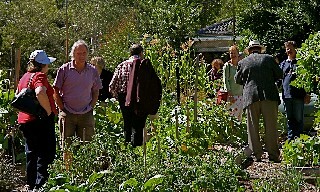 Once the project was established, the church accepted an invitation from the gardeners to host a morning tea to express their appreciation. This was held after a Sunday service in the open under umbrellas. COGS arranged an eight-piece folk musicband, the garden was open for inspection, and the gardeners were on hand to give gardening tips and advice! The then Chairman of Church Council, Peter Crimmins (who is also a COGS member and gardener), introduced some of the key COGS members, including those who had successfully applied for a new $20,000 Federal community water grant on behalf of the church. Two massive rainwater tanks installed during 2009 are now full. This rainwater is to be shared between COGS and the church. Currently it is applied to the garden, and later will be used in the church hall toilets. As well as the water harvesting program, O’Connor has developed a sustainable native plant garden and hosted a greening seminar where the pilot of the Five Leaf Eco-Awards was launched. 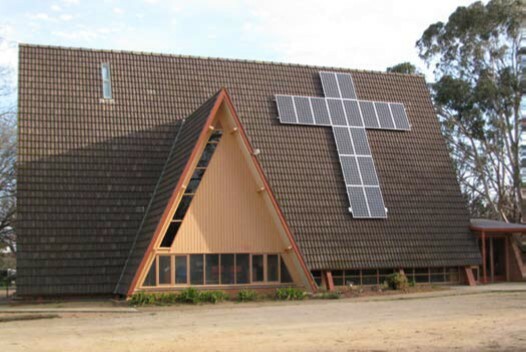 An array of 16 solar panels, in the shape of a cross has recently been installed. It’s a 2.72kW system, estimated to produce about 3,500 kWh of energy annually, saving 4.24 tonnes of CO2 emissions per year. Our annual electricity bill is expected to be reduced by around 37%.